The McHale round bale splitter is powered by one double acting hydraulic cylinder and a uniquely designed knife, it will securely transport bales from the stacking site to the feeding location. 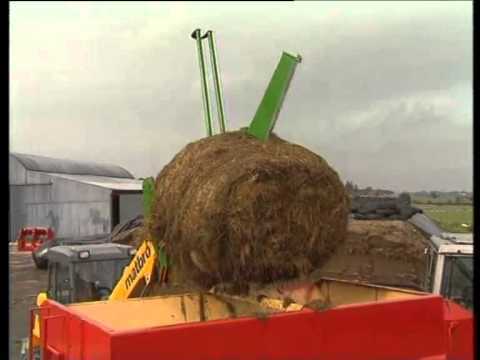 The operator simply splits the bale as desired in the feeding area or into a feeder wagon. If the splitter splits the bale in the feed out area, it can also be used to push the bale segments into the feeding location. It is supplied in a standard configuration as a three point linkage machine, but can also be fitted to a tractor loader or industrial handler. To make an enquiry about New McHale 994 Round Bale Splitter call us on ROI 048 6634 8213 | NI 028 6634 8213.